Love is best expressed by sending this gift of Joyful Paradise One Dozen Orchid Stems Arrangement to your near and dear ones. This appetizing Orchids Arrangement is decorated with Tissue. 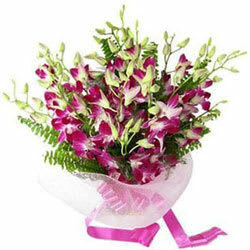 Love is best expressed by sending this gift of Joyful Paradise 15 Orchid Stems Arrangement to your near and dear ones. This appetizing Orchids Arrangement is decorated with Tissue.